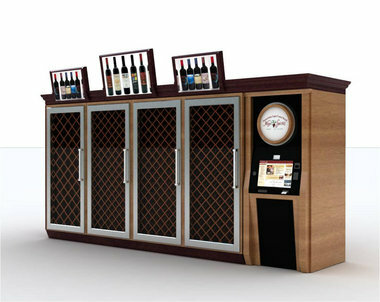 It appears the Pennsylvania Liquor Control Board’s controversial wine kiosk program is coming to a close now that the State and Simple Brands, the manufacturer of the machines, couldn’t come to an agreement on money the State alleges Simple Brands owes. As you are aware, these kiosks are, first of all, HUGE. Like, I think the Wizard might live in them. I have never used the kiosk in my local Giant Eagle because at first I was intimidated by the sheer size of the machine, then it was out of order for several months, and then I was not chancing the machine eating my driver’s license for lunch, which was one of the reported malfunctions. I was previously aware that in order to receive a bottle of wine from a kiosk, you had to swipe a valid ID to prove you were of age. I was also aware of the added Big Brotheresque step of breathing into a breathalyzer to ensure that the customer is not drunk. The customer must … look into a surveillance camera that is remotely monitored by a state employee in Harrisburg who approves the sale after verifying the buyer isn’t drunk and matches the photo ID. AND THEY CHOSE THE FIRST TORTUROUS OPTION. God save us from the Commonwealth, the Mommy Dearest of Big Brothers. One of my favorite part that you left out was that the kiosks had the same hours as state stores, which takes away one of the conveniences of having wine sold in grocery stores. There’s apparently no bottom to the humiliation y’all up there will endure. 75% of the time I’ve been past one of these there’s a state employee standing by to assist with the purchase. That means that for every purchase at a machine housing maybe 100 different SKUs you’ve got two state employees involved. Our state is a mess. In the list of evidence to prove “our state is a mess” the wine kiosks are pretty far down, IMHO. We have, what?, one in nine bridges with serious problems, we laid off teachers by droves, and we want to seriously diminish our clout in national elections by splitting our take of electoral votes by district. Yeah, the wine boondoggle probably puts over the top on this one. And in defense of this program, in this morning’s PG, Joe Conti, the LCB’s CEO said the experiment was “an innovative attempt to marry the convenience of buying wine with buying food in a supermarket.” See, all those other states who simply put wine on a shelf are absolutely not being “innovative.” Conti also said that while it certainly wasn’t a failure, it didn’t end up successful. See, there really is an alternate universe in which our political appointees reside. @ Bucdaddy, yeah, but do the angels want to wear your red shoes? Legislation to privatize the state stores has been around for ages. The last serious attempt was during Ridge’s first term and he got so much flack from the unions that he never brought it up again. Having worked in Harrisburg off and on for over the past 13 years, @Larry, trust me, it’s way closer to what I put forth than Ginny. And why is the wine not on the shelf next to the beer in my Giant Eagle? Is it that I have a better chance of buying wine, while drunk, than beer? Honestly, you go to the store, grab beer off the shelf, walk up to the register, pay for the beer and walk out. And this all takes place while Joe Yinzer is only at step 2 of the Wine Kiosk Sobriety Checkpoint Test. is it me, or does every state store employee look like they must have a relative somehow connected to the government? And asking questions to them usually brings stares of bewilderment…..
Why not just have a cop there on duty to administer the white line/backwards alphabet/axe-juggling field sobriety test? I mean, let’s be REAL sure that the drunks aren’t buying alcohol. Lets see… how could we make it easier…. Hmmm… how about simply letting the Giant Eagle (or any other store) clerk simply allow me to grab a bottle off the shelf and then have THEM looks at my ID. Could it possibly be that easy? Nah… lets just waste loads of $$$$ to make sure the process is completely screwed. PLus… I’ll never understand why they would need to have a breathalyzer… Are they saying that I shouldn’t be drunk when I’m buying a product that will make me drunk? Honesty compels me to say that the state store employees in my small Mercer County town are friendly and seem knowledgable about the products. And since it was pointed out that, should privatization ever occur and supply and demand being what it is, I may have to open my own liquor store to insure I get the brand of wine I like, I think I’ll stick to the way things are now. Not that they’re ever going to change in my lifetime. This IS Pennsylvania, after all. The kiosks should have saved on payroll and benefits for state store employees, but it didn’t. Perhaps to cut down on payroll expenses, I’ve oberved an increase in the number of 20-somethings working in state stores. The older employees cost more. The trade off is the product knowledge. just do what I did….move! It’s getting to be the time of year where the climate in Florida is becoming more tolerable…but buying wine and beer in the grocery store is on the list of reasons to live here too! That said, can’t wait to be back in western PA this weekend – woo-hoo! @Butcher… why wouldn’t a private store be able to order the brand of wine you like? It works fine that way in other states? You speak the truth! This is a genius post, point well illustrated. But then again… it is the government we’re talking about here. @Cnik: maybe. Takes longer than just walking into my local state store now, though. @Cnik — In PA, if another state store has the wine, then they can swap it out. If not, it can only be ordered and sent to @Butcher’s Dog’s neighborhood store if the distributor has a contract with the LCB. Out of state wine distributors — especially when dealing with small batches and small vineyards –do not have contracts with the LCB, primarily due to volume. He’d be pleased to know that his legacy lives on. How did the state make that decision? Easy. The company that makes the kiosks are friends of Ed Rendell, and gave $400,000 in campaign donations. Yinz laugh at us down here in Fayette County, but I can take the new 43 toll road (another brilliant cost-benefit analysis from Harrisburg) and in 20 minutes (round trip) on my lunch break buy beer and liquor at a gas station the way God intended, cheaper than the state store even when you add in the toll. And for anyone that thinks that dropping the state stores would raise prices and limit selection, check out the new-ish Kroger near Ruby hospital next time you’re in Morgantown. The staff in the beer and wine department know their stuff, take special requests with no hassle, and their prices have been anywhere from 10-30% less than here in PA (in my experience). Of course that’s if you could find the same brands here in PA anyway, which often you can’t. Shibori speaks the truth. I live a mile from that Kroger. It does, however, not have a liquor department. The University Towne Center Giant Eagle, a few miles down the highway from Mount Morris, does have a liquor department and a decent wine selection, but a crappy beer cooler. Can’t have everything, I guess. Anyway, Shibori, I invite you to venture a little farther and visit the Morgantown Brewing Co. downtown or the outpost of Mountain State Brewing in the Wharf. I on a regular basis stop at the Circle K,here in AZ and pick up a 16oz can of Becks beer. They have wine too but I’m a beer drinker. The clerk has yet to administer a breathlyzer to me before he sells me the beer. Thats convenience. Just finished listening to the NPR show Radio Times discussing this issue. Now the whole country is making fun of PA. They asked for people who used the machines to call in to discuss their experience and no one would admit it. I used one at the giant iggle at the Waterfront. I couldn’t find the Riesling listed in the “white wine “sections so I hit the help button.. and a voice from within the machine asked me what I needed help with. I was so freaked out. They were very nice and talked me through where to find the button for the Riesling bottle, but for a minute there I really did think there was a wizard inside that ginormous vending machine.